I've always enjoyed ghost tours. Last October I actually joined our "Social Travel" meetup group on a "party bus" trip to Gettysburg and I must say it was interesting for the party alone. One of my crafty fellow travelers brought bags of items onboard and made her costume on the way to the destination. When we arrived she was all "decked" out as a Christmas Tree--lights and all! Because I boarded last, I was relegated to sitting in the rear on a bean bag chair in the renovated school bus where the ride was particularly bumpy. From my bag of tricks I pulled a corkscrew and a wineglass. I attracted a fair amount of attention as they watched me go to work. I must admit I was pretty proud of myself when I failed to spill a single drop and the feat seemed to impress my fellow tipsy travelers as well. These past few trips were a little more subdued, but I must admit I captured a few interesting pictures in Maryland. Were they ghosts? You can view the photos and decide for yourself. Located at 777 Baltimore Street is the headquarters for the Ghostly Images of Gettysburg tours, where a docent guided me on a tour of the adjoining Civil War orphanage to recount the story of an honorable effort that turned tragic. The story began with a Union soldier who was found dead on the battlefield, clutching a ferrotype of his three small children. In an effort to locate his family, newspapers around the nation ran with the story and the word spread. After about four months the widow stepped forward and the dead soldier was revealed to be Amos Humiston. Prominent citizens, "chiefly in Philadelphia," were so moved that they created the National Homestead for Orphans of the United States. The Humiston family took up residence in the institution, with the widow acting as headmistress. All was well until widow Humiston remarried and moved to Massachusetts, leaving the orphanage at the mercy of a cruel headmistress named Rosa Charmichael. 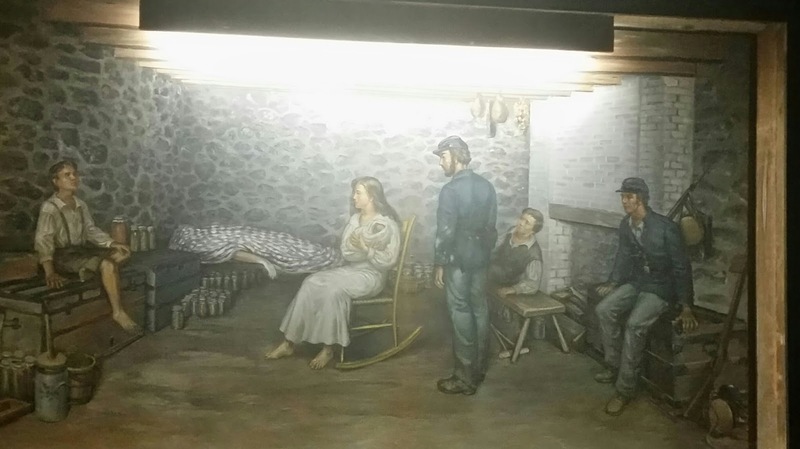 During the 90-minute tour, visitors learn the story of Rosa's reign of terror and can view the basement where those who "misbehaved" were chained. Guests can inspect the "table of toys" that is often disturbed. Toys often disappear from the table and are found in various places in the basement, according to guides. "Every few months we gather them up and put them back on the table," said Liz Lang. The table of toys that often end up in other areas of the basement, according to the guide. To learn more about Charmichael and how the story ends, you can book a tour by visiting their website at Ghostly Images of Gettysburg. Ghostly Images of Gettysburg also features a tour of the Jennie Wade House, which appears much like it did 150 years ago. Wade is known as the only civilian to be killed at the Battle of Gettysburg and the historic house provides guests with a perspective of what life was like when the war wreaked havoc on the town. Statue of Jennie Wade outside the residence. Guests may be surprised to learn that Wade didn't actually reside at the house, but was visiting her sister, who had given birth during the Battle. Toiling in the kitchen as her sister convalesced, she was struck by a bullet that pierced two doors. Door at the Jennie Wade House where bullet holes are evident. At the end of the tour, guides lead guests to the basement to view a picture of "What a Mother Saw," to show how Jennie Wade's body was laid out in the dank recesses of the house until the Battle came to an end. Painting in the basement of the Jennie Wade House, titled, "What A Mother Saw"
The Easton Maryland Ghost Walk, one of the Chesapeake Ghost Walking Tours, begins at the beautiful, historic and allegedly haunted Tidewater Inn, which I called home for a few days while visiting the area. A group of us gathered outside the inn to listen to a narrator address the crowd. She told the story of a haunting by Mr. Arthur Grymes, who built the hotel that opened to the public in 1949. I have yet to make the acquaintance of Mr. Grymes, but hope to if I return. Narrator tells tales of things that go "bump in the night." Other stops on the Easton Ghost Walk include an old jail, an orphanage, the "Odd Fellows" Hall and Foxley Hall, home of Colonel Oswald Tilghman and known as the "most haunted house in Easton." At the conclusion of my trip, I began researching the house and became a bit sidetracked by an article that ran in The Baltimore Sun in February of 1889. The Board of Trustees of Agriculture of the Eastern Shore of Maryland joined to tantalize their taste buds with an interesting repast. The "test dinner," served at Foxley Hall, was held to decide the "comparative merits of succulent mutton and Chesapeake diamondback terrapins," according to the article. The newspaper reports that Colonel Tilghman served his guests a "complete Chesapeake Bay dinner," before describing in disturbing detail how the terrapins were cooked alive and subsequently served from chafing dishes. Also on the menu that evening: red-head ducks from Eastern Bay cooked for 18 minutes and salt oysters, served with "subsidiary viands." Ok, so I took a little detour there, but I found it all fascinating and sad for the terrapin. Could it be that Foxley is considered the most haunted house in Easton because the terrapins came back to haunt Tilghman and his cruel band of brothers? 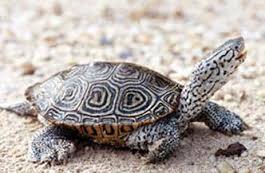 The "Terror of the Terrapins" could be a shell of a story, but, alas, it is just a figment of my imagination. The "real" tale, I'm told, is that the house is haunted, in part, due to an insane relative who was confined to the third floor of the Tilghman house. Here's the picture I captured in early September. The final stop on our tour of haunted Easton was the Spring Hill Cemetary where 10,000 Eastonians have been laid to rest. I snapped a few shots while visiting with our group. A member of our group touches what the guide referred to as a "Healing Tree." One thing I enjoy about ghost tours is that you learn so much about history and you get to poke around neighborhoods, after dark, within the safety of a group. Snooping around, listening to a little gossip, digging into the story a little more--later, on your own time--it's something most reporters enjoy. At least that's what I surmise. The fact that you might just capture something unusual on camera is merely icing on the cake. Ghost walks can be fun. The places here look very interesting - lots of history.